Meghalaya Chief Minister Conrad Sangma with the portrait of his father Late PA Sangma. 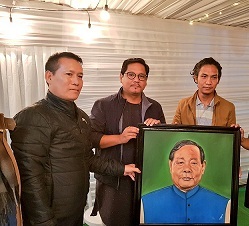 The Chief Minister of Meghalaya, Conrad Sangma, has sung paeans of praises for young artist from Manipur Jonathone for beautifully painting a portrait of his Late father PA Sangma. Conrad Sangma’s father – Purno Agitok Sangma – more popularly known as PA Sangma – was a political stalwart whose demise in March 4, 2016 has not only left a void in the political firmament of Meghalaya but also in the country. PA Sangma served as the Speaker of the Lok Sabha from 1996 to 1998 and the Chief Minister of Meghalaya from 1988 to 1990. A man of grit, Sangma was expelled from the Congress on May 20, 1999, along with Sharad Pawar and Tariq Anwar, for raising the banner of revolt against Sonia Gandhi over the fact that she was a foreign-born citizen. Sangma along with Pawar and Anwar wanted a native-born citizen to be projected as the Prime Ministerial candidate. After his departure from the Congress Party, he was one of the founders of the Nationalist Congress Party (NCP) along with Sharad Pawar and Tariq Anwar in 1999. The people of Meghalaya are reposing a lot of faith in Conrad Sangma vis-à-vis he would live up to the image of his father who was a political legend per se and a well-respected Parliamentarian.